President Trump has spoken plainly in favor of the People of Venezuela, and stands ready to take decisive action. He’s said: “All options are on the table”. America’s Southern neighbor needs it now more than ever. The fake news media, meanwhile, are bringing out their big guns. They are like hounds, always on the hunt for potential weaknesses in President Donald J. Trump’s policies and moves. This time though, they are going way too far. They are trying to use the White House’s stance on the deep & deadly humanitarian crisis in Venezuela to bolster their own agendas. This is honestly and humanely unforgivable; they would ignore the pain and suffering of a whole Nation if it meant putting a dent on the President’s followers’ numbers. Venezuela needs the World’s help ASAP, and cries for it on the streets, torn asunder by twenty years of mismanagement, the deepest levels of corruption the Western Hemisphere has seen, and a “Mafia State” model imported from and directed by Cuba. Beyond the Gulf of Mexico and the Caribbean Sea, there is a piece of land that shines bright; it has snow-peaked mountains, vast jungles and beautiful beaches, and also riches like few other countries around the World. Ample reserves of oil, gold and precious metals, along with some of the best agricultural products in quality and quantity –like cocoa, coffee, sugar cane and tobacco— should most definitely keep the Nation that lives there well-fed, on top of the list of World-wide producers and competitors and ready to face whatever the future throws at them! This is Venezuela. Reality though, is far from that. We Venezuelans are closer to that Leonardo Di Caprio movie, Blood Diamond… For almost 40 years we had our Golden Age; social-democracy (like the one in effect in countries like Britain, Spain, Norway, Sweden, Japan and South Korea) built a robust oil-producing economy –PdVSA or “Petróleos de Venezuela, Société Anonyme” (Venezuelan Petroleum Corporation) was the envy of the World, with the highest standards of production the industry has ever seen. It also eradicated poverty (for real, not the shameful excuse the UN has recently come up with) and had Venezuelans looking boldly into the future. Then a militia-strongman by the name of Hugo Chávez came to power. The “pardoned” author of a failed but bloody coup-d’état (1992) was sworn in as president in 1999. We had sealed our doom. All has been downhill ever since. Chávez did have a brief moment of success in stabilizing the economy, but given the fact that oil prices had skyrocketed (around the year 2005), even a toddler could have managed to do that! The truth is, this charismatic “caudillo” (military leader) had planned our downfall all along. It’s so many things, it is hard to tell in an orderly manner. He aligned himself with the evils of the World: Hussein, Gaddafi, Al Assad. All his “friends” and defended by him to the bitter end. He “worked” (if it can be called that) in close coordination with other dark, failed regimes in the Americas: Correa in Ecuador, Da Silva and Rousseff in Brazil, Kircher and his wife in Argentina. Those are all gone now, but the fact remains, for instance, that this madman payed the whole Argentine foreign debt back in the day! Who does that, you could ask? No, dear reader, not a friend. A populist leader bent on acquiring as much power as he could, however he could. As such, he put his bet on gaining the sympathies of his pairs Hemisphere-wide, and mostly succeeded. This is who Hugo Rafael Chávez Frías was. This megalomaniac and ruthless “commander” (as they called him) had, additionally, bought the OAS (Organization of American States) votes of many in the region, including Nicaragua’s Daniel Ortega and Bolivia’s Evo Morales. He had the votes of the majority of “pirates of the Caribbean” as Professor Leáñez of Simón Bolívar University (Caracas) calls them; little islands that received all the Venezuelan people’s oil they wanted in exchange for their silence, loyalty and complicity. This shameless individual, with no idea of planning or administering a country, even had on his side a character the World fails to recognize in his full Machiavellic vileness: Barack Obama. A Democrat twitched just now. It is true, even if he himself would deny it. We saw him shake hands and smile amply at the criminal that ruined a once-prosperous nation. His would-be successor, Hillary Clinton, had no different intention. It is evident from the debates and interviews that she meant to keep her mouth shut as we Venezuelans starved and were violently silenced on the streets by the regime’s thugs and “Bolivarian Armed Forces” (on-par with Gaddafi’s Green Revolution Guard, or the so-called “Army of the Guardians of the Islamic Revolution” in Iran; all of them armed forces in service of a radical political standpoint, against the CONSTITUTIONAL mandate of non-proselytism). Anyways, This guy Chávez had the full support of a true “Axis of Evil”, as President George W. Bush once put it. Above all, Cuba’s Fidel Castro had gained a new pupil, one that would serve his dark plans well. For more on this, please check here and here. “His Majesty” Castro has controlled Venezuela’s economy ever since, and stolen away from Venezuelans all he’s wanted. Well, at least until he died some 2 years ago, and was succeeded by his brother Raúl Castro, who recently stepped down in favor of the current Cuban dictator, Miguel Díaz-Canel. Since the year 2002, the Cubans, of course, have infiltrated our National Armed Forces, and turned it into their brothel; they do as they please, with no-one to oppose them. The infection goes deep, the infestation wide. This is already beginning to look like a Latin American horror novel, but it sadly is not. On top of it all, there is this weird “sect” in Cuba that worships Yoruba deities and demons in the guise of Catholic saints: santería. Their high priests, “paleros”, are among the top advisors to he-who-sits-atop Miraflores (the National Executive Palace, like the White House), in favor of whom they have practiced dark rituals beyond imagining (like those that followed the exhuming of the remains of Simón Bolívar, one of our Founding Fathers). I have not seen it, nor would I want to, but it is a widespread rumor that human sacrifices (involving even the protesters they have murdered on the streets and all the blood that has flowed) are not uncommon within the walls of that palace or the Fort of Tiuna (South of Caracas, where most of the high-ranking officials of the regime hide when things don’t bode well for them). Take these reports with a grain of salt, but don’t ignore the potential for destruction of an unholy union such as this abomination! This already seems like too much, even in the eyes of the average Dem. But it was not, not for Chávez before dying in early 2014, nor for his successor: Nicolás Maduro Moros, an ILLEGAL ALIEN bus-driver from the border-city of Cúcuta (Colombia). Before dying, as a last gesture of his endless socialist rudeness, the late Chávez ordered his cronies to vote for this individual –that is, to cheat in his favor. So, to sum it up, Chávez ruined our country, and this murderous dictator inherited the ashes, plunging our once-proud Nation into the pits of the abyss. You see, the regime’s high levels are corrupt to the bone, and they have managed to infiltrate every institution at every level, with Venezuela’s electoral system being no exception, but rather a cornerstone of their Mafia State. It’s like in Zimbabwe; the whole World knows the regime there rigged the elections. Exactly THAT is what Chávez and Maduro used to do and still do. They were friends with that guy Mugabe, BTW. Once this grim character took office, all hell broke loose. Maduro is even thought to suffer from “mild” mental retardation. It really comes as no surprise. It’s hard to describe the depths of idiocy and blatant lack of brains Venezuela has been forced to sustain at the hands of this incapable and pitiful excuse of a “leader”. If you knew Spanish and heard the witless bable he utters EACH TIME he opens the sewer-pipe he has for a mouth, you’d think the same no doubt! If Chávez was the artificer of our doom, then this pathetic guy Maduro (along with the rat-nest around him) became its enforcer and Venezuela’s executioner. He is really clueless, absolutely disabled and without shame in his vile actions. The perfect mix for disaster. It becomes obvious that he alone cannot be behind all of this. 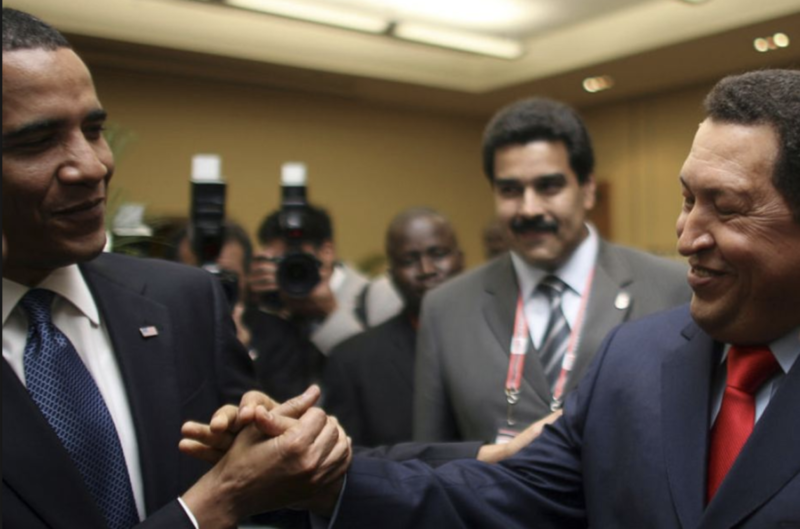 He is not, but rather is a puppet of two parties: the Cubans, the Chinese and the Russians on one side (along with funeral-attendees like the Turks, Lebanese Hezbollah and every one of their “pals” World-wide), and his own partners-in-crime within Venezuela’s borders, on the other hand. Names like Diosdado Cabello, Elías Jaua, Tarek El Aissami, Tarek William Saab, Delcy “The Ugly” Rodríguez and her brother Jorge (though most likely not known by the People of the US) are at the top of the list. A list the White House knows full well. They have all been duly and severely sanctioned financially by President Donald J. Trump’s Administration more than once, and even the NY Times has been forced to report on it. I repeat, THE THUGS AND OPPRESSORS have been sanctioned, not the Venezuelan people. This must be clarified because there are those among the dishonest media and their local “friendlies” that like to say Venezuelans are suffering because of the United States. It cannot be stressed enough: We only suffer because the humanitarian aid the U.S. of A. is working to deliver to us still delays! For Christ’s sake, there’s even a viral video on Twitter of a woman in a hospital west of the Capital City of Caracas begging social services to help her remain alive! She cries: “Please don’t let us die!” She has a small daughter whom she fears to leave behind alone amid this Dante’s Inferno scenario of a country we Venezuelans are currently stuck in. To begin to wrap this up, this ultra-corrupt gang of thugs and shameless murderers has led OUR country (and not Maduro’s because he’s Colombian) into a pit of the deepest depression possible; inflation rates are off the chart by an incredibly long shot (the jaw-dropping amount of 1,000,000% on December 2018, with a forecast of TEN MILLION PERCENT if Maduro remained in power), the national means of production have come to a virtual stand-still (becoming almost useless in the most-basic function of feeding the people), and above all else, they remain bent on violent popular repression. Since images (and videos) speak louder than words, I ask you to please CAUTIOUSLY take a look at the Humans Rights Watch footage of the violent and hellish repression we the People of Venezuela have endured (at the hands of this murderous regime) and judge for yourselves. Last year alone, around 150 young men and women were ruthlessly murdered on the streets for exercising their Constitutional right to protest! Since January 10th, 2019, some 850 people have been thrown in jail, 77 of which were children! Around 35 people have been killed; the numbers are not 100% accurate because the censorship on honest and credible reporting has been absolute, with the poorest in the country fed nothing but lies thru the official channels (that is, all of them), that depict Alice’s Wonderland instead of the rampant misery and decay that grip my homeland of Venezuela. It must be shouted loud and clear World-wide that this is, by all accounts, a Mafia State; this is how they operate, after deceiving the people thru the lies of Socialism. They kidnap the local populace and make them beg for crumbs of bread, all while filling their pockets endlessly (with money and literal mountains of gold extracted from OUR national soil) and serving as continental platforms of terror and crime and drug-dealing. Enough is enough! But yes, narcotics. That guy mentioned earlier, Cabello, has been proven by the DEA to have more than links to drug cartels in the region; he’s one of their Dons. “El Cártel de los Soles” (The Cartel of the Suns). That’s how it’s called. He runs a local chapter of it in Venezuela, all while publicly displaying his violent ways on the State-owned “Venezolana de Televisión”. Needless to say, that places the thugs and murderers on the same list as paramilitaries such as the FARC (Colombian Revolutionary Armed Forces; irregulars and traitors to the people, obviously) or the ELN (“Ejército de Liberación Nacional“, also formed in Colombia but with more presence in Venezuela these days, given them being “birds of a feather” with Maduro’s cronies). For years there have been reports that ETA (the Basque separatist & terrorist group) has been operating within Venezuela’s borders, under the auspices of Maduro and Chávez before him. The list, as you all can see, is wide and long, and darker as we go deeper. To make it all abysmally worse, Maduro’s May 2018 election was a sham (HE CHEATED, DID NOT WIN!) with a boycott by the opposition and voter turnout at a record low. If this all was made into a movie –which might happen sooner than later— the story would seem endless, our sufferings without limit, on-par with what was suffered by the Armenians, the Kurds or even the Jews, my good God forgive me. Venezuela is on the brink of catastrophe because of the 100% unpopular moves her kidnappers have chosen to take (and take note, NOT because of those willing to lend us aid right now). They could not even rob the people “subtly”; that’s how corruption “usually” works after all, stealing silently. But no; the damned genocidal maniacs decided they could kidnap Venezuelans and steal their resources in broad daylight! Do you know what President of the USA Donald J. Trump told them? “I DON’T THINK SO. YOU GOT AWAY WITH THIS UNDER OBAMA, BUT NOT ANYMORE”. For such a gesture, we the People of Venezuela will be eternally grateful. This friendship that’s being born will endure forever. We are also supremely thankful to people in pivotal roles in the US, such as Vice-president Mike Pence (who spoke on Friday in favor of my People), Secretary of State Mike Pompeo, National Security Advisor Amb. John Bolton, US Official Envoy to Venezuela’s Legitimate Government Elliott Abrams, US SouthCom Commander Admiral Craig Faller (formerly Commander Kurt Tidd), among others, including Republicans Sen. Marco Rubio, Sen. Mario Díaz-Balart and Sen. Ileana Ros-Lehtinen, as well as OAS Secretary-General Luis Almagro. Our God Most High bless them all, the USA and our beloved Venezuela!